Originally published in 1940 as Kansas Geological Survey Bulletin 29. This is, in general, the original text as published. The information has not been updated. For many years asphalt rock has been widely used in America and Europe for surfacing city streets, and during the last few decades it has been used extensively for building rural roads. The usefulness of the material for paving has thus been proved. In the United States the principal producing states are Texas, California, Oklahoma, Kentucky, and Alabama. Various other states are known to have deposits of rock asphalt, some of which have been worked commercially. Although the states named produce relatively large amounts, the use of the rock asphalt has been restricted to small areas, owing to the fact that the entire bulk of the surfacing material must be shipped from the mine, which is a great disadvantage in competition with paving materials that use aggregate from local sources. The product of each quarry must be tested in experimental sections by time and traffic, and the value of some of the deposits in various parts of the country has not yet been proved. Articles in the technical press and textbooks pertaining to the bituminous industries seldom mention this district as a source of supply for semi-impregnated bituminous sandstone and limestone. . . . Within the past few years much has been done by business men to stabilize this industry of preparing a processed paving material from these deposits. . . . Our detailed study of the Missouri-Kansas rock asphalts has indicated that these excellent road-making materials merit more study by private, state, and federal engineers of road design. Since the foregoing remarks were written, much more asphalt rock from Linn County has found a market in states east of Kansas. It is not recorded that any of the Kansas product has been used for Kansas roads. The Missouri product is being used locally, and highway officials are being praised for their efforts to procure road materials having low initial cost and low maintenance cost. The purpose of this paper is to assemble the available information concerning the eastern Kansas deposits and to offer suggestions for more extensive explorations. I have made a thorough examination of sandstones and porous limestones in several eastern Kansas counties and have found indications that, may extend the known areas and add others. The known deposits and indications of asphalt rock are described in this paper. Acknowledgments--A few years ago Dr. John W. Ockerman, then of the Kansas Geological Survey, studied asphalt rock in Linn County and in nearby areas. He prepared a report on the occurrence of asphalt rocks in eastern Kansas. His report has not been published, but has often been used as a reference. I have incorporated his findings in this paper. I am indebted to Mr. W. P. Stoker, Kansas Rock Asphalt Company, Pleasanton, Kan., for information concerning the holdings and operations of his company. Mr. Charles Kinney, county engineer of Linn County, Mound City, Kan., has from time to time notified me of the making of road cuts and the opening of quarries in Linn County. His cooperation has been of great value, in this and many other studies. Mr. C. E. Heinz, Independent Gravel Company, Joplin, Mo., has for a long time been a student of the economic. geology, especially that pertaining to engineering problems, of a large part of Central United States, and he has been very generous with his information concerning the occurrence of asphalt rock in eastern Kansas and western Missouri. Mr. Heinz and Mr. Stoker have criticized the manuscript of this paper. Natural asphalt consists of solid or semisolid hydrocarbons that have been formed naturally from petroleum by the evaporation of the lighter hydrocarbons and the partial oxidation of the residue. Artificial asphalt is obtained as a residue from distillation of some crude oils, and a large part, 80 percent, or more, of the asphalt produced in the United States is obtained in this way. Natural asphalt may occur in "lakes" at the surface, as in the Burmudez asphalt lake in Venezuela and on the island of Trinidad. More generally the asphalt fills "voids" in porous rocks, where it may serve as a cement, binding the rock particles together, or it may simply occupy interstices in rock that is bound by other mineral cementing material. Rock that contains asphalt is known as asphalt rock. The asphaltic content in most cases ranges from about 5 to 15 percent. Asphalt rock is generally impregnated porous sandstone or limestone. Some writers prefer the term "bitumen" for the hydrocarbons in such rocks, but that is a matter of choice of terms. "Asphalt" is used in this paper. Asphalt rocks were formerly petroliferous rocks, which lost the lighter constituents of the crude oil. This loss must have taken place through evaporation near the earth's surface. Inasmuch as the asphalt represents oil accumulations, the physical conditions that, govern the accumulation of oil should apply also to asphalt. Observations in eastern Kansas indicate that lithologic variation rather than attitude of beds has been responsible for the accumulation. Asphalt rock is used for road-making. Artificial asphalt is likewise used in paving, but as a binding material for aggregate obtained locally. In the crushed asphalt rock the binder and aggregate are both present. In practice, artificial asphalt is added to many leaner asphalt rocks after crushing. In a well-made pavement, the aggregate is as important as the cement, hence the nature of the rock is an important factor to be considered. Kansas asphalt rock is of two kinds, sandstone and limestone, hence there are two kinds of aggregate in crushed material, which can be blended to produce almost any desired mixture. In eastern Kansas there are commercial deposits of asphalt rock in Linn County, and in the same county are several other deposits that, are not being worked. Old oil seeps in Miami County warrant exploration in that county. In Labette County, pockets of very heavy crude oil in porous, cavernous limestone, and some partly impregnated porous limestone at the surface indicate that commercial deposits of asphalt, rock may be found. Weathered outcrops of impregnated rock have lost most of their asphalt. The commercial deposits have been found in artificial exposures or by shallow drilling. Figure 1 shows the location of these eastern Kansas counties. Other counties in eastern Kansas may also be profitably tested by drilling in areas where porous rocks lie close below the surface. It should be noted, however, that the presence of asphalt in such rocks is unusual; that is to say, one may expect to examine a great many porous rocks without finding asphalt. Figure 1--Index map of Kansas showing counties discussed in this paper. The known asphalt rocks in eastern Kansas are Pennsylvanian in age. They are porous limestones and sandstones in the Marmaton group, the Bourbon formation, and the Bronson group. These rocks are exposed at the surface in a band, ranging in width from about 15 to 40 miles. The outcrop band extends from Miami and Linn counties southward to Montgomery and Labette counties. With the other Pennsylvanian rocks, they dip gently north of west and hence are buried below younger sedimentary layers west of the outcrop area. Next below the Marmaton group is the Cherokee shale group. Its area of outcrop is east of the area described. Sandstones in the Cherokee shale contain asphalt in western Missouri and are the most important asphalt rocks of the district. It is very probable that sandstones in the Cherokee group may contain asphalt in Kansas, but inasmuch as asphalt seems to have formed only near the present or a former erosional surface, it is not probable that the Cherokee sandstones are asphaltic in areas very far beyond the western part of the outcrop area. In order to make this report more or less self-contained, figure 2 is presented to show the general areal distribution of rocks pertinent to asphalt in eastern Kansas, and figure 3 is included to show the general character and sequence of these rocks. The formations are described in ascending order. Figure 2--Map of southeastern Kansas showing outcrop areas of rocks, surface indications, location of quarries, and areas recommended for testing. (Outcrops from geologic map of Kansas, Kansas Geological Survey, 1936.) An Acrobat PDF version of this figure is available (4.8 MB). Figure 3--Stratigraphy in southeastern Kansas in reference to asphalt rock. The Cherokee shale is the lowermost rock unit in which asphalt has been found in the Missouri-Kansas district. It lies unconformably upon the weathered surface of the Mississippian limestone, and it is the oldest Pennsylvanian rock of eastern Kansas. The thickness in Linn County is about 350 feet. The thickness increases southwestward. According to Bass (1936) the thickness in Labette County ranges from about 400 to more than 500 feet, the thickness increasing southeastward in the county, but Abernathy (1939) reported that the Cherokee shale thickens southwestward in Labette County. According to Pierce and Courtier (1937, p. 37), in the northeast corner of Crawford County the thickness is 375 feet, and in the southern part of Labette County, 560 feet. The Cherokee shale consists principally of dark-gray and black .hale, but it includes several lenticular sandstones and a minor amount of limestone. Sandstones in this group are important oil reservoirs in eastern Kansas and in northeastern Oklahoma. Asphalt-bearing rocks are not known in the Cherokee group in Kansas, but the principal asphalt rocks in eastern Missouri are those in this unit. The most persistent sandstone zones are the "Bartlesville" sandstone near the middle part and the "Squirrel sand" near the top. Local names are applied to the Cherokee sandstones where they crop out, and in Missouri a sandstone called "Clear Creek" contains asphalt in southeastern Vernon County. The "Clear Creek sand" lies near the "Bartlesville" horizon. One quarry is situated about 22 miles east of the southeast corner of Bourbon County, Kansas. Other reported outcrops of asphaltic sandstone in the same zone are those in southeastern Vernon County, Missouri. Sandstones higher in the Cherokee group comprise the most important asphalt deposits yet discovered in the district. There are several commercial quarries in this zone in western and southwestern Vernon County, and in northwestern Barton county, Missouri. Zones in the Cherokee shale in which asphalt is present in Missouri at a very shallow depth in southeastern Bourbon County, in eastern Crawford County, in Cherokee County, and in eastern Labette County, Kansas. These zones deserve careful examination in Kansas. It is suggested that in prospecting, shallow drill holes or test pits be made on surfaces a few feet above exposures of sandstone in the areas mentioned. The Fort Scott limestone, which overlies the Cherokee shale, contains some asphalt, but there is little evidence to warrant extensive prospecting. As far as is known to me, no asphalt is being taken from this rock, but I have found partial impregnation in weathered exposures of more porous parts of this limestone in a quarry about 0.5 mile east of Girard in Crawford County, Kansas, and cavities a few inches in diameter filled with heavy crude oil have been uncovered in working this quarry. It should be noted that surface exposures, even near commercial asphalt quarries, show little evidence of the asphalt that fills the rock a few feet away, but below the surface. The Fort Scott limestone is about 35 feet thick in Bourbon County, Kansas. Abernathy (1939) has reported its thickness to be about 100 feet in southwestern Labette County, Kansas. A few feet of shale separates the upper and lower limestone members of the formation. The line of outcrop of the formation is shown on the map, figure 2. The Labette shale overlies the Fort Scott limestone. As it contains local sandstones, it is a potential source of asphalt. Sandstone in this formation in the northeastern part of Vernon County, Missouri, is reported to contain some asphalt at the outcrop. A similar asphalt-bearing outcrop in the central part of Bates County, Missouri, indicates a possible commercial deposit of asphalt. In southeastern Linn County the Labette formation is about 40 feet thick, but the average thickness along the outcrop in Kansas is about 60 feet. The formation is predominantly shale, but, contains some lenses of sandstone and a very minor amount of limestone and coal. The sandstones have not been studied in great detall, but there is a thick sandstone in this zone in southeastern Linn County and northeastern Bourbon County. Prospecting in T. 23 S. and T. 24 S., R. 25 E., in these two counties and in central Crawford County is recommended. There are only a few fresh exposures of the sandstone, called Englevale, that occurs locally in the Labette shale, and I have found no indications of asphalt at the exposures. Inasmuch as nearly all outcrops of the sandstone are deeply weathered, the absence of surface indications is not necessarily indicative of the absence of asphalt a few feet below the surface. Surface indications in Missouri just east of the southeast corner of Linn County are encouraging. Next above the Labette shale is the Pawnee limestone. The thickness of the Pawnee formation in Linn County is about 35 feet and it increases southward to southeastern Bourbon County, where it is nearly 50 feet. It is somewhat less farther south. In Linn County about 15 feet of shale occupies the lower middle part of the formation, but this separating shale is much thinner farther south. Much of the upper part of the formation consists of porous limestone, the porosity being due to slender, nearly microscopic hollow tubes of fossil corals. In a newly opened quarry in sec. 15., T. 23 S., R. 24 E., in southern Linn County, the upper part of the Pawnee limestone is impregnated with asphalt. Prospecting is recommended in this area. The Pawnee limestone crops out along a very sinuous line from southeastern Linn County to southern Labette county. It forms a prominent escarpment a few miles west of the Fort Scott escarpment, which lies along the outcrop line shown in figure 2. The upper Pawnee limestone is porous in much of its area of outcrop and prospecting might be profitable over a wide area, but examination of many quarries has shown no indication except that mentioned. The Bandera shale overlies the Pawnee limestone. Locally it contains many feet of sandstone, but no asphalt has been found in it. It is especially sandy in its outcrop area in Bourbon and Neosho counties, Kansas. The thickness ranges from 40 to 50 or more feet, and locally the formation is nearly all sandstone. Inasmuch as the Bandera formation yields oil in northern Linn County, it is possible that asphalt will be found along its outcrops, although scores of weathered exposures do not show indications of asphalt. I have examined several exposures in water wells during the digging, as well as all fresh road cuts and sections in mines. R. E. Whitla, of the Kansas Geological Survey, collected a hand specimen of sandstone from an old lead and zinc mine dump in sec. 5, T. 22 S., R. 25 E., Linn County, which is charged with asphalt. It is reasonably certain that the specimen came from the subsurface at that place and belongs either in the Bandera or Labette shales. A coal bed near the base of the Bandera formation is being mined in Linn and Bourbon counties and in nearby parts of Missouri. Although examination of all available quarry exposures as well as many scores of deeply weathered surface exposures of this limestone has failed to show any asphalt, the formation is described here because of the porous limestone it includes. It overlies the Bandera shale and ranges in thickness from about 8 feet in Linn County to 20 feet or more in Labette County. The formation consists of two limestone members separated by about 2 or 3 feet of shale. The shale contains abundant small phosphatic concretions. From Neosho County southward the shale is very dark gray or black. In Labette County, the lower limestone member is very similar to the upper member of the Pawnee formation, which is described in this paper as being porous because of the presence of fossil corals. This condition characterizes the lower member of the Altamont formation in a considerable area in central and southwestern Labette County and in southeastern Montgomery county. Beds between the Altamont limestone formation and the Bourbon formation, belonging to the upper part of the Marmaton group, are not very porous and are not described here. These strata are classified in ascending order: Nowata shale, Lenapah limestone, and Memorial shale. An erosional break separates the Memorial shale from the Bourbon shale. Locally the Memorial shale is absent because of this erosion, and in eastern Linn County, near Pleasanton, the basal part, of the Bourbon formation rests on a surface almost as low as the top of the Altamont formation. The Bourbon shale is about 150 feet thick and its base is about 20 feet above the Altamont limestone. It contains the next higher asphalt-bearing rock of the district. The asphalt occurs in a sandstone, which is the basal formation of the group. This sandstone is persistent across Kansas from Linn County to Labette County. In general, it is not more than 4 feet thick. In Linn County, in sec. 25, T. 21 S., R. 24 E., about one mile north of Pleasanton, it is about 16 feet thick, and the rock is highly charged with asphalt. The deposit there is being worked by the Kansas Rock Asphalt Company and is being processed in the company's plant in Pleasanton. The rock consists of fine, angular grains of quartz, locally tightly cemented with calcium carbonate. The asphalt occurs in streaks and bands in portions of the rock where the cementing material seems to have been partly leached. Rich zones constitute a large proportion of the rock being taken from the quarry. In the rich zones the saturation with asphalt seems to be complete. This deposit is the only one in Kansas now being worked. Analyses of samples from the quarry one mile north of Pleasanton are included at the end of this paper. Plate 1--Views in the Kansas Rock Asphalt Quarry one mile north of Pleasanton, Linn County, Kansas. It has been estimated that the holdings of the Kansas Rock Asphalt Company, comprising about 220 acres in sec. 24 and sec. 25, T. 21 S., R. 24 E., are underlain by asphalt rock averaging 12 feet thick. J. W. Ockerman found that the deposit thins eastward and becomes less asphaltic. In a test pit in the SW SE NE sec. 25, T. 21 S., R. 24 E., he found 3 feet 2 inches of asphaltic sandstone, and about the same thickness in the NE SE SE sec. 24 of the same township and range. I have found that the weathered outcrop of the sandstone in the NE NW sec. 30, T. 21 S., R. 25 E., about one mile northeast of the commercial quarry, shows a considerable amount of asphalt. Indications are that the reserve in this area is large. Several years ago, when a cellar was being excavated in the S2 SW sec. 36, T. 21 S., R. 24 E., 0.5 mile west of the southeast part of Pleasanton, asphaltic sandstone was reported to have been discovered. It is said that a 6-foot bed of asphalt rock was exposed later in a pit that was opened near the first excavation. The rock is no longer exposed. The line of outcrop of the base of the Bourbon formation and hence the outcrop line of this asphalt rock is shown in figure 2. It is believed that beds between the basal part of the Bourbon formation and the Bethany Falls limestone member of the Swope formation need not be described here. No asphalt is definitely known in these rocks, although former oil seeps in northern Linn County probably belong here. These strata are classified in ascending order: upper part of Bourbon formation, Hertha limestone formation, Ladore shale formation, lower part of Swope formation. All of these strata, except, the Bourbon, belong to the lower part of the Bronson group. The Swope limestone, as shown in figure 3, constitutes the middle part of the Bronson group. In Linn County it lies about 200 feet above the asphalt-bearing rock in the Bourbon formation. The upper limestone of the formation, the Bethany Falls limestone, contains asphalt in northern Linn County. The Bethany Falls limestone ranges in thickness from a very few inches in central Labette County to about 25 feet in Linn and Miami counties. In Miami, Linn, and Bourbon counties much of the upper part of the member consists of what is known as oolitic limestone, rock composed of small spherical or sightly ellipsoidal particles of calcium carbonate held together by the same substance. The cementing calcareous material is generally less pure and hence less soluble than the tiny spheres, the oolites, so it is often found that the oolites are dissolved, leaving a very porous rock. This is the condition in places where the Bethany Falls limestone contains asphalt. The upper part of the member contains asphalt in the W2 NW sec. 20, T. 20 S., R. 24 E., and in the SE sec. 21, T. 19 S., R. 24 E. Both points are in Linn County. The former was worked for some time by the Kansas Rock Asphalt Company, but the quarry is now abandoned. Several years ago a company was organized (Ockerman, 1932, p. 6) to produce rock asphalt from the latter location, but little material was taken from the site. The weathered exposures in these quarries have lost most of the asphalt, but very rich material has been produced there. Several years ago I collected at the first location samples from which the bituminous material fairly dripped. The area merits further investigation. The line of outcrop of the base of the Swope formation is shown in figure 2. As shown in figure 3, the upper formation of the Bronson group is the Dennis limestone. It is similar to the Swope formation and in Linn County the two are separated by only a few feet of shale, called the Galesburg formation. Farther south in Kansas the Galesburg shale is much thicker and includes much sandy material. Although no asphalt has been found in the Galesburg formation in southern Kansas, the formation might well be tested in western Labette County in the area called the Labette County Ozarks. The upper member of the Dennis formation is the Winterset limestone. Like the Bethany Falls limestone, it, is partly oolitic and porous. It is described here because of its known porosity and because in northwestern Labette County it contains pockets of very heavy crude oil. Oil-filled cavities in the Winterset limestone can be seen in a quarry in the NE sec. 8, T. 31 S., R. 18 E., northwest of Dennis in Labette County. This area merits prospecting. Plate 2--An oil seep in Winterset limestone, in the NE sec. 8, T. 31 S., R. 18 E., Labette County, Kansas. Figure 2 shows the location of the base and top of the Dennis formation at the surface in southeastern Kansas. As one goes westward from the areas of outcrop of the rocks described, he traverses the outcrops of higher and higher formations. Many of these younger rocks locally contain porous rocks. There are no known asphalt, deposits in them, but the former existence of "tar springs" in Miami and Linn counties in areas of their outcrop should be mentioned here. Many years ago Swallow (1866, p. 85-89) reported more than 20 tar springs in Miami County. He especially mentioned springs in these locations: secs. 2 and 8, T. 17 S., R. 24 E.; secs. 30 and 33, T. 17 S., R. 25 E.; sec. 31, T. 18 S., R. 24 E.; secs. 3 and 30, T. 19 S., R. 24 E. The last-mentioned location is in Linn County. It is commonly reported that Indians knew of the springs of oil and utilized the product. The presence of the springs led to the early drilling for oil in Miami and Linn counties. Early settlers obtained axle grease from a "tar spring" in the northeast corner of sec. 16, T. 17 S., R. 25 E., in Miami County. The excavation there from which oil was dipped is still evident. This spring occurs in the upper part of the Chanute shale, and from Swallow's report of locations and descriptions it seems very probable that several other springs exist, in this zone. The upper part of the Chanute formation in this part of Kansas consists of several feet of porous buff sandstone, called Cottage Grove sandstone. The location of the spring in Linn County as given by Swallow is in or near an area of outcrop of the Bethany Falls limestone, but the tar may have seeped from higher or lower strata. It is probable that it came from sandstone near the top of the Bourbon formation. Some other oil seeps in northern Linn County have been reported. A seep reported in sec. 27, T. 19 S., R. 23 E. is probably in sandstone near the top of the Bourbon formation. Porous sandstones and limestones in the areas near former oil springs warrant prospecting, although little surface evidence remains. It is probable that some of the springs had been artificially kept open for many years before Swallow's survey. In the foregoing part of this paper I have discussed the geologic position of rocks pertinent to the occurrence of asphalt. The following discussion concerns the geographic distribution of the same strata. No asphalt rocks have been found in Miami County, but the presence of asphalt in the Bethany Falls limestone less than one mile south of the county border in Linn County suggests that tests in that rock in T. 18 S., Rs. 23 and 24 E. are warranted. The approximate location of the outcrop of the limestone is shown in figure 2. It has been stated that many years ago oil seeps, or "tar springs," in Miami County were well known. It is not definitely known whether these seeps represent residues of heavy oil in near-surface reservoirs or oil that has migrated up fissures or fault planes of small displacement from a greater depth. The presence of oil in deeper reservoirs, at depths of a few hundred feet, and the presence of some faults in the area seem to strengthen the latter hypothesis, but the association of the seeps with porous rocks, especially the Cottage Grove sandstone and a similar sandstone in the upper part of the Bourbon formation, which yields oil in Missouri not far northwestward, lends weight to the assumption that the seeps represent a residue of oil in thse near-surface beds. On the strength of this reasoning it is not out of place to recommend some investigation of these strata in Miami County. Reported oil seeps are indicated on the map, figure 2. Linn County is the only county in Kansas in which asphalt rock is being produced. The Kansas Rock Asphalt Company, Pleasanton, Kan., has holdings and a quarry in sec. 25, T. 24 S., R. 24 E. Highgrade asphalt rock is being obtained from a sandstone in the lower part of the Bourbon group. The reserves in this part of Linn County seem to be large, as explained in the section in which the geology of the occurrences was discussed. Surface indications have been observed on the outcrop of the sandstone as indicated in figure 2. It should be noted that asphalt has been seen on the surface or in shallow excavations in secs. 19, 24, 25, and 36, T. 21 S., R. 24 E., and in sec. 30, T. 21 S., R. 25 E. All these occurrences are in the same sandstone stratum, the outcrop of which is shown in figure 2. Limestone asphalt rocks occur in both the northern and southern parts of Linn County. A quarry in sec. 20, T. 20 S., R. 24 E., was worked for some time by the Kansas Rock Asphalt Company and high-grade material was produced. The asphalt there occurs in the porous upper part of the Bethany Falls limestone member of the Swope formation. A similar occurrence is known in sec. 21, T. 19 S., R. 24 E., and, as previously stated, a quarry was open there several years ago, but has been abandoned. There is very good reason to believe that these areas include a considerable reserve of asphalt rock. The locations are indicated as quarries in figure 2. A quarry for road-metaling material was opened in sec. 15, T. 23 S., R. 24 E., in the summer of 1939. It was observed that the limestone there is partly impregnated with asphalt. The location is shown as a surface indication in figure 2. Testing in this area is recommended. Because asphalt has been observed on the outcrop of Labette sandstone in Missouri just east of the southeast corner of Linn County, this sandstone should be tested in Linn County. The occurrence of asphaltic limestone in Linn County in sec. 15, T. 23 S., R. 24 E., just north of the Bourbon County line, suggests the possibility of finding asphalt-bearing limestone in the central and northeastern parts of T. 24 S., R. 24 E., in Bourbon County. The approximate outcrop line of the base of the Pawnee limestone, which is asphaltic in southern Linn County, is shown in figure 2. It is suggested that tests be made in the upper part of the limestone on surfaces that lie above its outcrop. Asphalt has been seen on an outcrop of Labette sandstone in Missouri near the northeastern corner of Bourbon County and for that reason it is recommended that this sandstone be tested in that part of Bourbon County. As stated in another part of this paper, asphalt-bearing sandstone is being taken from sandstones near the top of the Cherokee group in western Vernon County, Missouri. Therefore, areas in eastern Bourbon County, east of Fort Scott, indicated in figure 2, should be tested. There is one slight surface indication of asphalt in Crawford County. 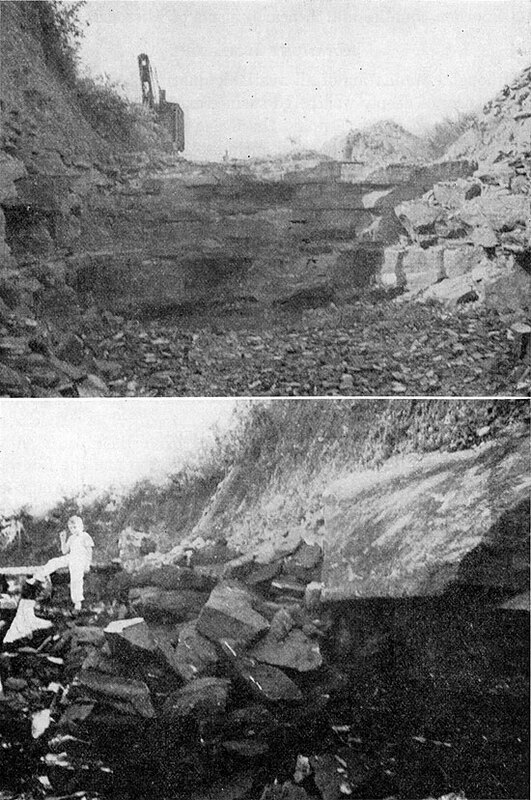 It is the small amount of asphalt found on the weathered exposures of porous upper Fort Scott limestone in a quarry near the east side of Girard. Because sandstone in the Cherokee shale in eastern Missouri is asphaltic, sandstone in eastern Crawford County, in the area shown in figure 2, may bear asphalt, and such sandstones should be tested. Because these sandstones have not been mapped, specific areas for testing are not shown in figure 2. In Neosho County the Pawnee limestone, the Bourbon shale, and the Bethany Falls limestone crop out, all of which are asphaltic locally in Linn County, but examination of many exposures has not shown asphalt in this county. The Bethany Falls limestone does not retain its porous character in this part of the state, so it is hardly expected to contain any bituminous material in this county. 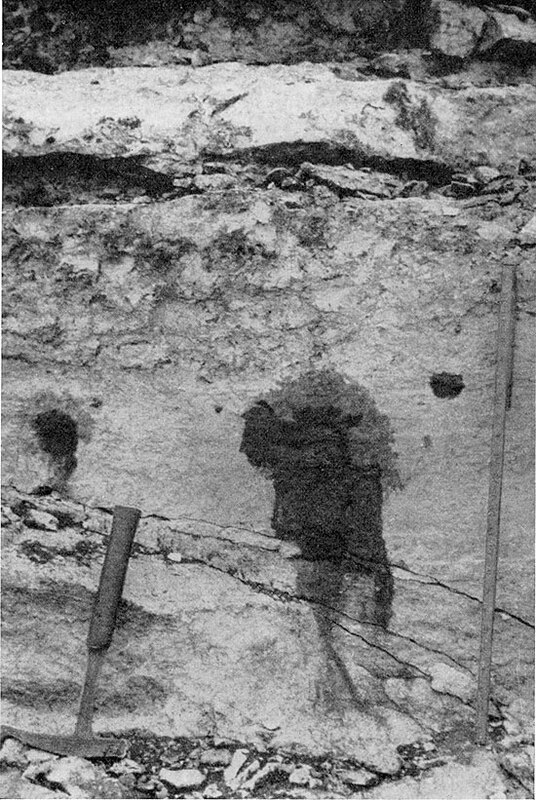 The sandstone at the base of the Bourbon formation is about 4 feet thick along its line of outcrop, which is shown in figure 2. The Pawnee limestone is present at the surface in the southeastern part of the county, but it is not very porous. The Bandera shale formation, which overlies the Pawnee limestone, is somewhat sandy in southeastern Neosho County, but asphalt has not been found in it. The only rocks in Cherokee County that might be expected to contain any asphalt are the Cherokee shale and possibly the Fort Scott limestone. The former lies immediately below the soil in most of the area of the county, as shown in figure 3. There is a considerable amount of sandstone in the Cherokee group here, and the sand zones correlate approximately with the asphalt-bearing sands in the same group in Missouri. Although they have been well exposed in coal workings, they still warrant some testing. As in Crawford County, the sand zones in the Cherokee shale have not been mapped accurately in this county and hence definite areas are not cited for prospecting. The same rocks that crop out in Neosho County occur in Labette County, but those that contain asphalt farther north are seemingly barren here. Because of the presence of pockets of heavy crude oil in the Winterset limestone in the Dennis formation in sec. S, T. 31 S., R. 18 E., northwest of Dennis in the northeastern part of the county, nearby areas in which this limestone lies just below the soil cover are recommended for testing. It was noted elsewhere in this paper that the Galesburg shale, which underlies the Dennis formation, presents a thick sandy facies in this part of Kansas. This sandy shale is one of the important natural resources of Labette County, as it has formed a deep residual soil and is an excellent aquifer. Because of its porous texture it may contain asphalt in the western part of Neosho County. There is much porous limestone in Labette County, and it is similar to the porous limestone that contains asphalt in southern Linn County. This limestone is the lowest member of the Altamont formation and crops out in many places along Pumpkin creek from Mound Valley southwestward to the southwest corner of the county. The following data were supplied by Mr. John Deal, chemist of the State Geological Survey. Table 1--Analyses of Kansas asphalt rock. A. Pawnee limestone from road-metal quarry, sec. 15, T. 23 S., R. 24 E., Linn County. B. Sandstone from the base of Bourbon formation, from the Kansas Rock Asphalt Company quarry, sec. 25, T. 2,1 S., R. 24 E., Linn County. C. Weathered sandstone from outcrop of base of Bourbon formation in the NE NW sec. 30, T. 21 S., R. 25 E., Linn County. It will be noted that the analyses are incomplete. The Pawnee limestone is principally calcium carbonate, hence the 79 percent assigned to SiO2 + Fe + CaO is mostly CaO. In the other two analyses the percentage assigned to SiO2 + Fe + CaCO3 is largely SiO2 as the rock is a fine-grained sandstone consisting almost entirely of grains of quartz cemented with calcium carbonate, but the latter has been leached away before the introduction of the hydrocarbons. There is obviously some mica in the sandstone. The term petroleum includes hydrocarbons soluble in carbon disulphide, and the term bitumen includes hydrocarbons insoluble in the same substance. Abernathy, G. E., 1939, Oil, gas, and coal in Labette County, Kansas: Kansas Geol. Survey (Text on back of Oil and gas exploration map, Labette County, Kansas). Heinz, C. E., and Netzeband, W. F., 1932, The Missouri-Kansas rock-asphalt deposits; Roads and Streets (Chicago, Ill.), Oct.
Ockerman, John W., 1932, Asphalt rocks in eastern Kansas: Kansas Geol. Survey, unpublished report. Swallow, G. C., 1866, Preliminary report of the geological survey of Kansas: Kansas Geol. Survey report, 198 p..
Placed on web May 11, 2009; originally published in June 1940.